Composing Word documents sometimes requires you to add reference links to show your readers more information about your topic. Any update on this Word documents also requires you to check every links you posted if they are still valid. 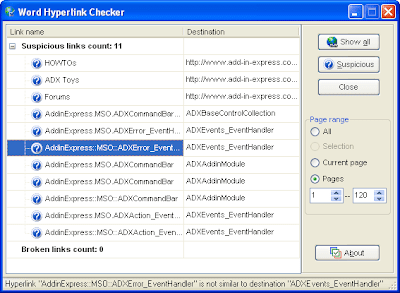 Document Hyperlink Checker for Microsoft Word is a free MS Word add-in for managing and checking internal hyperlinks in Microsoft Word documents. It can automatically check hundred of hyperlinks and detect broken links in few seconds. 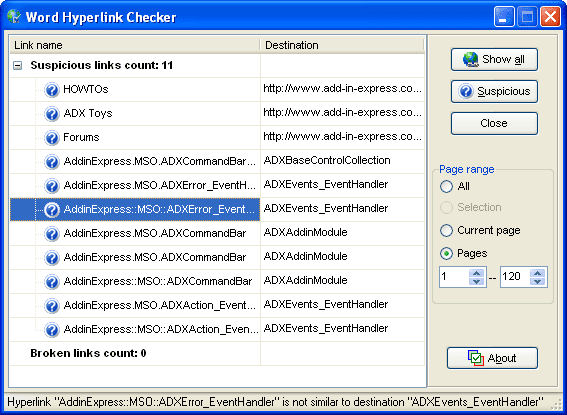 The hyperlink checker add-is was designed for Microsoft Word 2007, 2003, XP and 2000. Upon installation, it will automatically place a new menu shortcut in MS Word to open the Document Hyperlink Checker app. Only links that were created using the hyperlink option will be recognized as links.